Although the weather wasn't quite as nice for this trip as it was last year at this time, Bryden Robertson, Rachael Arnold and Evan Steiner all managed to coerce their parents into helping them reach the summit of Little Si. The morning did start out a bit drippy, but this just added to the wonderful amount of mud available on the trail to jump in, stomp through, and in general splash every possible way! The kids did wonderfully, walking almost a mile on the way up, and the same mile on the way down. A stop just below the climbing areas for snacks proved to be quite popular before walking along the dark and boulder studded base of the climbing crag. 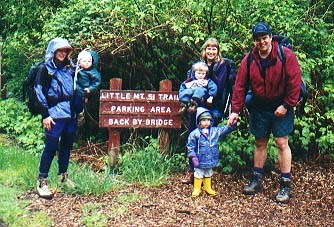 Once past this area, the trail steepened, and all three toddlers retreated to the safety and warmth of their back pack carriers, with only Evan remaining awake for the final stretch of trail to the summit. Once on top, however, it was lunch time (eating is never far away with two year olds! ), and the summit rocks provided a wonderful playground for climbing, with just enough puddles for throwing rocks into. Some other hikers even kindly provided a dog for an up close and personal wildlife encounter that seemed to particularly thrill Bryden. After stretching their legs and throwing arms, and filling their tummies, it was time to head back down again. The kids all got rides down to the flats again, and then walked much of the way down to the trailhead, and along the street back to the parking area. A wiggly and friendly puppy, a mailbox shaped like a fish, and two llamas in a pen provided the highlights of the return trip!